Home Our Garage Door Services Garage Door Repair Services Is Your Garage Door Operating The Right Way? Garage doors can jam, refuse to move or get stuck halfway open. Nothing is pleasant about any of these scenarios. Unfortunately, these things are far more likely to happen if your garage door system isn't taken care of. To catch problems early, we recommend paying attention to the movement & the operation of your door. If you notice anything out of the ordinary, you can take steps to address the issue before a total breakdown. Your goal should be to keep a functional door that will always move smoothly. 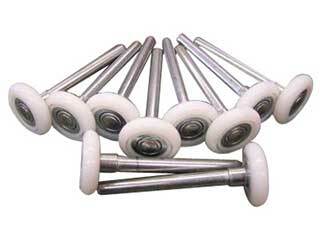 If you have overhead sectional doors, these move along your tracks with the help of little rollers. These components are all essential for smooth movement, worn rollers or dented tracks can cause your system to have to work harder over time. Dented tracks are one of the most common reasons for doors to come off their track - rendering your door inoperable until fixed. How Do Your Springs Look? In the same way that damaged tracks can affect the movement and functioning of your garage door, mal-adjusted springs can also cause major issues down the line. For this precise reason, frequent maintenance is important, during a routine service visit, our team at will assess the alignment of your entire system and make any adjustments as necessary. If you've noticed small gaps under your door after it's closed, this doesn't have to be too much of an issue. It most likely indicates a setting problem on your opener travel limit - basically, the opener thinks the door has completely closed when it hasn't. We recommend consulting your opener's manual and adjusting the setting earlier than later. Even the smallest gap can make it easy for moisture and small animals to find a way to creep in. By attending to minor faults early, you'll have a much better chance of resisting a breakdown. For further advice or assistance, just give our a team a call at Garage Door Repair Orange Park!